With a year left to go in Rick Perry's governorship, the future of the Texas Enterprise Fund is unclear. The two front-runners to succeed him have offered mixed messages on the fund in the past. When Gov. Rick Perry steps down at the end of this year, he will have awarded more than $508 million from the taxpayer-financed Texas Enterprise Fund to businesses looking to relocate to the state or expand existing operations here. But the future of the fund, which critics call corporate welfare, is unclear. The two front-runners to replace Perry, Republican Attorney General Greg Abbott and Democratic state Sen. Wendy Davis, have offered mixed messages on the economic development fund in the past, leaving questions about whether it will extend beyond Perry's tenure. 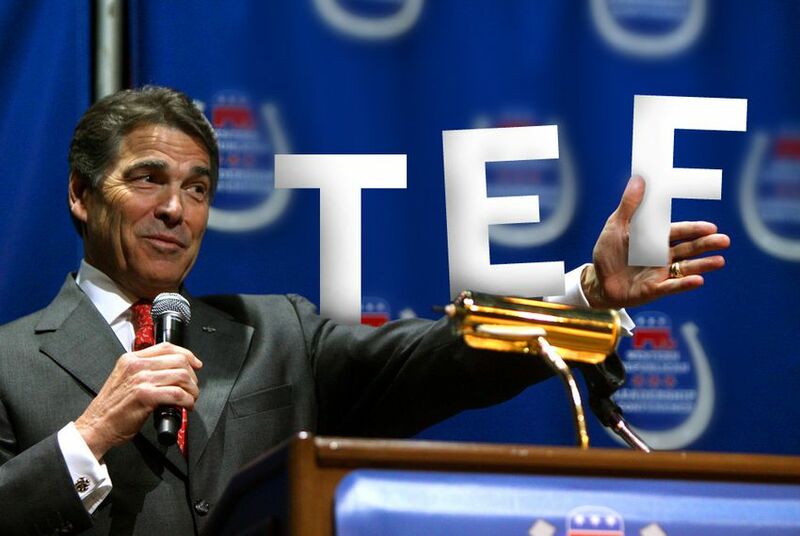 The fund has become a staple of Perry's governorship. The Texas Legislature created it at his request a decade ago, giving him the power — with the sign-off of the House speaker and the lieutenant governor — to grant awards with an initial appropriation of $285 million from the state’s Rainy Day Fund. Since then, Perry has relied heavily on it as a job recruiting tool, awarding millions in tax dollars to “close deals” with more than 100 companies. Since announcing his candidacy, Abbott’s stance on the fund has been cloudy. He said in his initial stump speech that he wants to get government "out of the business of picking winners and losers.” But when asked during a fall campaign stop if he would discontinue Perry’s fund, Abbott did not directly answer the question, saying a “good tax structure” is the best incentive for business in Texas. When asked for clarification about whether an Abbott governorship would include the Enterprise Fund, spokesman Avdiel Huerta reiterated the attorney general’s previous comments. “If Texas has the appropriate tax structure, that’s going to be the strongest incentive any business needs, whether it be businesses thinking about relocating from another state or businesses already here,” Huerta said. A week after announcing her own candidacy, Davis held a campaign event at San Antonio-based Rackspace, an internet hosting and data storage company that received a $22 million Enterprise Fund grant in 2007. She praised the arrangement as a model for public-private partnerships. But Davis’ support of the fund seems dependent on a return on investment. Campaign spokeswoman Rebecca Acuña said the senator “supports the premise of the Texas Enterprise Fund” but has worked to increase its transparency and accountability to taxpayers. And amid steep budget cuts to public education in 2011, Davis offered an amendment to defund the Enterprise Fund in order to lessen the burden on public schools. The amendment was rejected, and Davis later said it was “something I would usually never advocate” for, according to a report in the San Antonio Express-News. After the fund went unaudited for a decade, the Legislature in 2013 passed a bill co-authored by Davis requiring the state’s auditor to assure that the fund has followed state regulations in its grant approval and oversight process. Fiscal watchdogs have accused Perry of using the Enterprise Fund as a political slush fund, giving handouts to corporations and executives that support him. The governor has collected millions of dollars in campaign contributions from executives, political action committees and investors tied to companies that have received Enterprise Fund awards, including Sanderson Farms, which received a $500,000 grant, and McLane Advanced Technologies, which received a $1 million grant. Perry's office has vehemently denied that such contributions influence the governor's decision-making. The Legislature appropriated millions of dollars in additional financing to the Enterprise Fund in the years after it was created, and the fund held on to its money even amid the sweeping state budget cuts of 2011. Since that year, lawmakers have not added more money to the pot. As of the end of 2012, $139 million remained in the fund, according to a report prepared by the governor's office. Since then, Perry has continued to grant new awards, including a $12 million grant to Chevron in July and a $2.1 million grant to Natgasoline in November. If and when the fund runs dry, the Legislature would either have to decide to continue funding it — under a new gubernatorial administration — or let it peter out. When asked whether the governor hopes the fund will exist beyond his tenure, Nashed reiterated the previous statement.